A 12-years-old male presented with focal seizures, headache and vomiting of 10 days duration. On clinical examination there were no neurological deficits or papilledema. 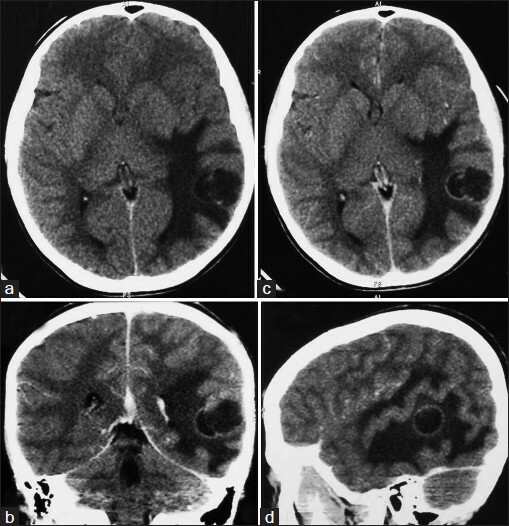 Computed tomogram (CT) scan of the brain showed a solid-cystic lesion in the left temporal lobe, which was hypo- to hyperdense with peripheral contrast enhancement [Figure 1]. Gross total resection of the tumor was done and sent for histopathological examination. Immediate post-operative period and further recovery was uneventful. Figure 1: (a-d) Computed tomogram scan of the brain showed a solid-cystic lesion in the left temporal lobe, which was hypo- to hyperdense with peripheral contrast enhancement and perilesional edema. Microscopic examination showed a cellular tumor, composed of monomorphous, bipolar cells arranged in dyscohesive sheeting pattern [Figure 2]a, interspersed with microcytic spaces and abundant myxoid matrix [Figure 2]c. The tumor cells were small to medium-sized, with scant cytoplasm and bipolar, short cytoplasmic processes arranged in an angiocentric fashion, forming pseudorosettes [Figure 2]b. Brisk mitotic activity and foci of necrosis [Figure 2]c was seen. However, no Rosenthal fibers or eosinophilic granular bodies were noted. Immunohistochemical studies showed strong glial fibrillary acid protein (GFAP) positivity [[Figure 2]a inset], p53 positive in occasional tumor cell nuclei [Figure 2]f and Ki-67 labeling index varied from 30-40%% [Figure 2]e in different areas of the tumor. Tumor cells were immunonegative for epithelial membrane antigen (EMA) [[Figure 2]d inset]. 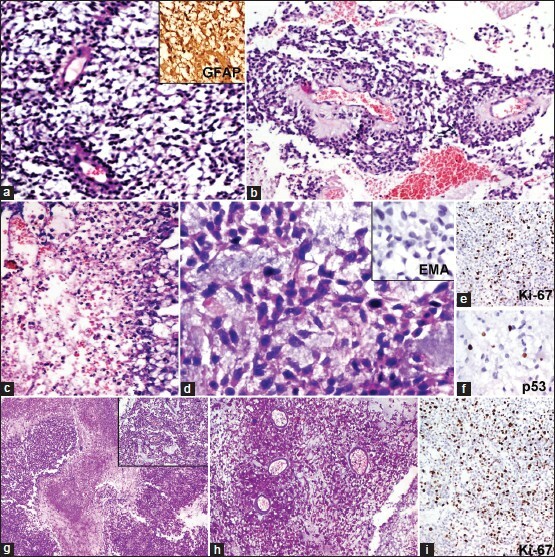 Figure 2: (a) Cellular tumor composed of bipolar cells in dyscohesive sheets (H and E, ×40); (b) Prominent angiocentric pattern (H and E, ×40);(c) Foci of necrosis (H and E, ×40); (d) Myxoid matrix (H and E, ×400). (a inset) Tumor cells are positive for GFAP (×40); (d inset) Negative for EMA (×100); (e) Ki-67 labeling index of 30-40% (×100); (f) Scattered tumor cells p53 positive (×100). (g): Radiation-induced geographic necrosis and preserved tumor in repeat excision specimen (H and E, ×40); (h) Ghost outlines of angiocentric tumor pattern (H and E, ×100); (g inset) Preserved angiocentricity and myxoid matrix (H and E, ×100); (i) Ki-67 labeling index of 40-50% (×100). The patient had received 50Gy radiation with concurrent temozolamide (TMZ) over a period of 5 weeks at 75 mg/m 2 . The patient presented with recurrence after two years. Histological examination of the repeat gross total excision specimen showed radiation-induced geographic necrosis [Figure 1]g and h, ghost outlines of angiocentric tumor pattern [Figure 1]h, with preserved tumor islands, retained angiocentricity and myxoid matrix [[Figure 1]g inset], and Ki-67 labeling index of 40-50% [Figure 1]h. The patient had received 50 Gy radiation with concurrent TMZ over a period of 5 weeks at 75 mg/m 2 , followed adjuvant TMZ at 150 mg/m 2 from day 1 to day 5, cycles repeated every 4 weeks. The occurrence in the setting of neurofibromatosis type 1 (NF-1) and KIAA1549:BRAF fusions have been reported in PMA. , Patients with PMA experience shorter progression free survival and higher local recurrence than those with juvenile PA.  Intra-cerebral metastasis of an intramedullary PMA,  leptomeningeal dissemination  and rapid progression to glioblastoma  have also been reported. A greater extent of surgical excision is associated with favorable outcome. But gross total excision may not be achievable in hypothalamic PMA and in such cases chemotherapy is instituted. Kim et al., have used cisplatin and vincristine to treat juvenile PMA of the opticohypothalamic region. Terasaki et al., successfully treated leptomeningeal gliomatosis of pilomyxoid astrocytomas with concurrent radiation and TMZ after failed frontline chemotherapy with carboplatin and vincristine. Adjuvant therapy with TMZ was incorporated in the present case, as the tumor's biological behavior was akin to high grade astrocytomas. It is important to separately recognize PMA from PA due to its propensity to involve younger age group, aggressiveness, higher local recurrence, metastasis, CSF spread and progression. Increased mitotic activity, proliferation index and necrosis or endothelial proliferation necessitates adjuvant therapy. Further follow-up and larger studies are needed to more accurately determine the prognosis of these tumors. 1. Scheithauer BW, Hawkins C, Tihan T, VandenBerg SR, Burger PC. Pilocytic Astrocytoma. In: Louis DN, Ohgaki H, Weistler OD, Cavenee WK, editors. WHO Classification of Tumors of the Central Nervous System. International Agency for Research on Cancer, Lyon, 2007. p. 243-4. 2. Janisch W, Schreiber D, Martin H, Gerlach H. Diencephalic pilocytic astrocytoma with clinical onset in infancy. Biological behavior and pathomorphological findings in 11 children. Zentralbl Allg Pathol 1985;130:31-43. 3. Tihan T, Fisher PG, Kepner JL, Godfraind C, McComb RD, Goldthwaite PT, et al. Paediatric astrocytomas with monomorphous pilomyxoid features and a less favorable outcome. J Neuropathol Exp Neurol 1999;58:1061-8. 4. Komotar RJ, Mocco J, Carson BS, Sughrue ME, Zacharia BE, Sisti AC, et al. Pilomyxoid astrocytoma: A review. Med Gen Med 2004;6:42. 5. Arslanoglu A, Cirak B, Horska A, Okoh J, Tihan T, Aronson L, et al. MR imaging characteristics of pilomyxoid astrocytomas. AJNR Am J Neuroradiol 2003;24:1906-8. 6. Lee IH, Kim JH, Suh YL, Eo H, Shin HJ, Yoo SY, et al. Imaging characteristics of pilomyxoid astrocytomas in comparison with pilocytic astrocytomas. Eur J Radiol 2011;79:311-6. 7. Johnson MW, Eberhart CG, Perry A, Tihan T, Cohen KJ, Rosenblum MK, et al. Spectrum of pilomyxoid astrocytomas: Intermediate pilomyxoid tumors. Am J Surg Pathol 2010;34:1783-91. 8. Rodriguez FJ, Perry A, Gutmann DH, O′Neill BP, Leonard J, Bryant S, et al. Gliomas in neurofibromatosis type 1: A clinicopathologic study of 100 patients. J Neuropathol Exp Neurol 2008;67:240-9. 9. Lin A, Rodriguez FJ, Karajannis MA, Williams SC, Legault G, Zagzag D, et al. BRAF alterations in primary glial and glioneuronal neoplasms of the central nervous system with identification of 2 novel KIAA1549:BRAF fusion variants. J Neuropathol Exp Neurol 2012;71:66-72. 10. Eigenbrod S, Thon N, Jansen N, Janssen H, Mielke J, Ruiter M, et al. Intramedullary pilomyxoid astrocytoma with intracerebral metastasis exhibiting oligoden-droglioma-like features. Rare Tumors 2012;4:e30. 11. Mahore A, Kammar A, Dange N, Epari S, Goel A. Diencephalic juvenile pilomyxoid astrocytoma with leptomeningeal dissemination. Turk Neurosurg 2011;21:222-5. 12. Paraskevopoulos D, Patsalas I, Karkavelas G, Foroglou N, Magras I, Selviaridis P. Pilomyxoid astrocytoma of the cervical spinal cord in a child with rapid progression into glioblastoma: Case report and literature review. Childs Nerv Syst 2011;27:313-21. 13. Komotar RJ, Burger PC, Carson BS, Brem H, Olivi A, Goldthwaite PT, et al. Pilocytic and pilomyxoid hypothalamic/chiasmatic astrocytomas. Neurosurgery 2004;54:72-9. 14. Kim SH, Kang SS, Jung TY, Jung S. Juvenile pilomyxoid astrocytoma in the opticohypothalamus. J Korean Neurosurg Soc 2010;48:445-7. 15. Terasaki M, Bouffet E, Maeda M, Sugita Y, Sawamura Y, Morioka M. Successful treatment of leptomeningeal gliomatosis of pilomyxoid astrocytoma after failed frontline chemotherapy. Neurologist 2012;18:32-5.